You can use the following procedure with either DE or sand filters. 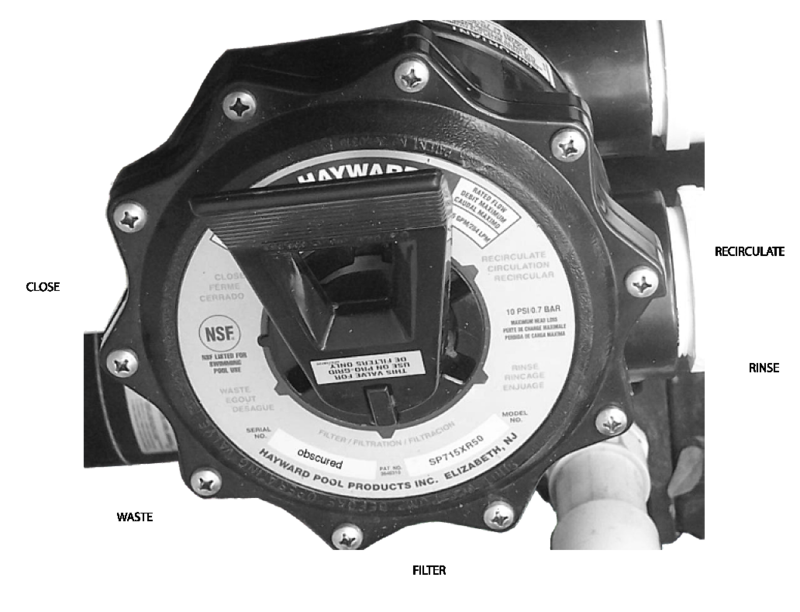 Move Multiport Valve to the BACKWASH position (if there’s a 2-way valve on the waste line, it must be open). Turn ON pump and wait for sight glass to clear (approximately 30-45 seconds). Turn OFF pump, then move Multiport Valve to RINSE position. Turn ON pump and wait for sight glass to clear (approximately 45 Seconds). Repeat Steps 1-5 until very little or no dirt is observed in the sight glass during Step 3. Once there is very little dirt, RINSE one last time, then turn OFF the pump. Move Multiport Valve to FILTER, then turn pump ON. If there’s a 2-way valve on the waste line, it must be closed for normal pump operation. If filter is DE, add 1/2# of diatamatious earth (one full 1# coffee can) for each 5 sq. ft. of filter area. RECIRCULATE: Use this if the filter is broken; at least you’re circulating the water. CLOSED: Us this to close off flow from the pool, usually to work on the equipment. Do not operate pump with valve in closed position. WASTE/DRAIN: Another filter bypass setting (like Recirculate), but this setting sends the water out through the waste pipe (hose), instead of returning it to the pool. Used to lower pool water level or to vacuum to waste if vacuuming fine, silty debris or algae.